The "deadline" to sign up for Obamacare is at the end of this month and rumors are already beginning to swirl about the impending new taxes that will be levied on April 1st. 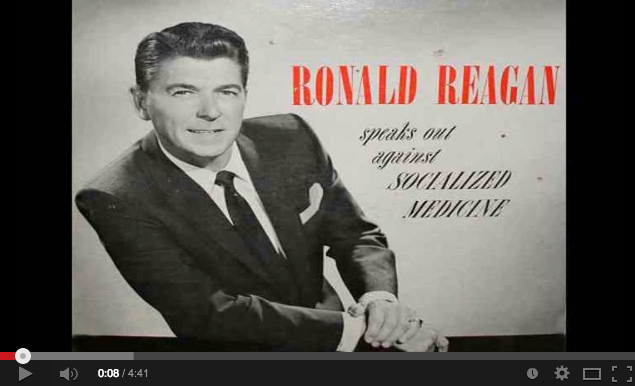 This discussion has reminded us of a recording made in 1961 by Ronald Reagan on the very topic of socialized medicine. Just shy of 5 minutes long, this speech could easily be given today and rings just as true. Ronald Reagan was surely a man ahead of his time and had the uncanny ability to put the most complex issues into simple terms. Health care reform was no different. So take some time out of your day and listen to this clip of the former President and make a resolution to continue the fight to repeal and replace Obamacare!